MMM list member Jim Rhodes sent me this article with the accompanying pics over 2 years ago. I've finally gotten around to posting this stuff...it's really good! I don't believe Boys Life is still in print, but just in case, all images and text are copyright Boys Life Magazine and used without permission. If anyone out there has a legal problem with me re-printing the material here, please let me know and I'll remove it immediately. Click on the image at left for a full- size diagramatic rendering of the suit (from the article). AFTER THE first U.S astronauts reach the moon and return, others soon will follow. One exploration now being planned will consist of four spaceships and 12 astronauts. Four spacemen will ride in each of three lunar-expedition passenger carriers. The fourth craft will be for cargo, including two "moonmobiles" for the 500-mile surface journey from the moon sea, Mare Imbrium, to the Crater Aristarchus. Such a journey has been selected because it will take the astronauts into high and low terrain. When they land, the crew will change into "moonsuits," an air-lock door will open in each spacecraft and cable hoists will lower the astronauts to the moon-dust surface. It will be night, the temperature 247 degrees Fahrenheit below zero. Darkness and extreme cold will be safer than the deadly radiation of solar flare activity during the moon's long 214-degree day. Partial weightlessness and the cold silence will give the astro- nauts an eerie feeling as they move about like turtles, operating their moonsuits from an inside control panel in front of their chest, switching on suit lights that focus where they walk. As an earth day passes, the crew will assemble two moon- mobiles, skeletonlike vehicles with oversize metal-tired "bicycle" wheels. They will maintain their direction without a compass, for there is no significant magnetic field on the moon. Four of the 12 astronauts will make the journey to Aristarchus to test equipment, take photographs, collect geological samples and carry on scientific studies. Every step, every heartbeat, every breath of the four-man exploring team will be reported back to earth. Besides carrying two astronauts the moonmobile will carry power and oxygen reserves, food supplies, test equipment and moon sample containers. Each astronaut will be connected to the moonmobile by a 20-foot umbilical tube, without which he could not survive for more than a few minutes. The journey starts off at five miles an hour from the bottom of Mare Imbrium. On one moonmobile rides the geologist for the expedition and one of the two medical-human-factors spe- cialists. On the other vehicle is the physicist and the specialist who handles power-communications and life-support functions. Back at moonbase the eight other astronauts are the life sciences doctor, the astronomer and six support-mission specialists. The explorers reach Yellow Mountain, a landmark long ob- served from earth and believed to be towering sulfur. This ex- planation seems plausible in view of terrestrial like moonscape with its pumice and volcanic ash. Siliceous igneous rock-quartz that has formed by solidification of molten matter below the moon's crust-may have pegmatite veins containing compounds of the lighter elements. Oxygen, though difficult to extract, might be obtained in quantity here. Water and other fluids from these lunar rocks will someday be used by future lunar expeditions to build underground cities. Moonsuits are made to tilt back as beds, but no one wants to sleep- too much excitement, too much to see and do. Through the eyes of this small group the dream of ages has come true- man is walking across the face of the moon. SPACE SUITS of the future will be more like shelters than clothing. Short on style, but long on reliability, they'll contain their own life- support Systems. Once outside the spacecraft they'll be attached to ground-powered vehicles that will carry the astronaut and his supplies. During the 'Ice Age cavemen wrapped skins about them to keep from freezing to death. Today's survival manuals of the Army and other services stress the importance of clothing to maintain correct body temperature, protect against sun, prevent skin damage and the bite of poisonous insects. In outer space men's clothing will become much more important to him. It will protect him against added dangers of cosmic and solar ra- diation, extremes of heat and cold (lunar tem- peratures range more than 450 degrees Fahren- heit)vacuum conditions and particles streaking through space without atmosphere to burn them Space suits of the future will be no ordinary flying suits. They'll be developed from astronaut clothing used in today's Mercury capsules. 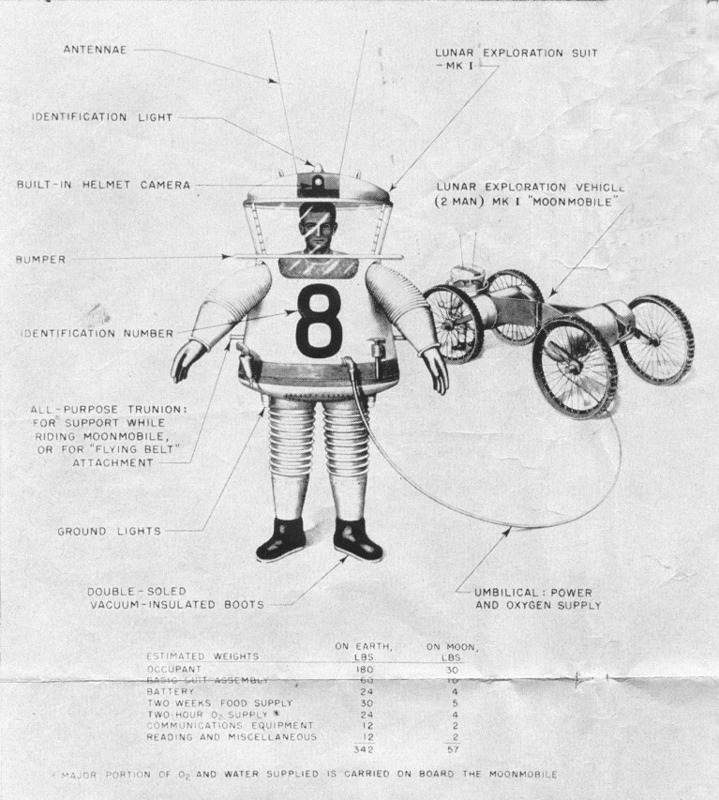 The torso suit is a closely fitted coverall with inner gas-retention ply of neoprene and an outer heat- reflective, aluminized nylon fabric; a helmet of resinous, impregnated fiber glass hard-shell with visor sealing and communication system; gloves with miniature finger lights; boots of aluminized, nylon fabric with tennis-shoe-type soles; and a cotton undergarment with long sleeves and legs. The space suit has become a compact version of the spacecraft cabin. Into it has been built a similar environment control system. Its basis is an air conditioner which is called a heat ex- changer. Hot air, carbon dioxide and body odor leave the suit by a ventilation outlet at the back of the helmet, drawn into the heat exchanger by a water-cooled fan, purified and sent back by a hose from the oxygen tank to the suit waist. Fresh oxygen is forced into the suit's distribu- tion ducts and carried to the limbs where it flows freely back over the body for cooling and pressurization. Several kinds of clothing will be worn during a space journey. During flight in a spacecraft, such as the Apollo on its way to the moon, astro- nauts will travel in a shirtsleeve environment, the same as the crews of the B-70. Astronauts will probably take turns wearing a space suit that will permit them to make outside repairs on the ship. When the crew reaches the moon they'll wear a space suit of more advanced design. The Lunar Exploration Suit, Model MK 1 has been developed by Space General Corporation for travel across the surface of the moon. It re- sembles a shelter because it must carry its own life-support system wherever it goes. The basic suit assembly weighs 60 pounds on earth, 10 pounds on the moon. It will carry a two-week food supply weighing 30 pounds; a two-hour oxy- gen supply, 24 pounds; battery, 24 pounds; com- munication equipment, 12 pounds; reading and miscellaneous material, 12 pounds. With an 180- pound astronaut, this suit will total 342 earth- pounds and 57 moon-pounds. Looking at this enormous suit from top to bottom, you see first a wide-domed headpiece with an identification light centered on top, V- shaped antennae, a built-in helmet camera and see-around faceplate that drops almost straight down to the shoulders to give the astronaut 360- degree vision. At collar height there is a bumper to protect the "windshield" and for another as- tronaut to grab in helping his buddy. At thigh level ground lights can be turned on. Boots are double-soled and vacuum-insulated. The astronaut will maneuver the suit much like a small tank. As he walks, he will use his arms inside to help the shoulder harness support the suit. He will operate dials and knobs on the control panel below the windshield for his life- support functions, to control the suit's cooking facilities, tune his radio and operate electronic equipment. From his "dashboard" inside the suit, he will also be able to manipulate a ground- powered vehicle which will support him with ad- ditional oxygen and supplies during exploration. This "Moonmobile" is technically called the Lunar Exploration Vehicle (2 man) MK I. It has a 20-foot umbilical which delivers oxygen and power to the space suit. The astronaut may walk with the vehicle, or he may choose to ride. If he rides, he hooks himself onto one end of the Moonmobile with support trunnions located on each side of his space suit. A mechanism on the vehicle will lift him off the ground and carry him in an upright position at five miles an hour. Also, when supported by the vehicle, the astro- naut can easily shift his weight much the same as in a lean-back chair. In this way he can tilt the suit horizontally for sleeping. It is padded down the back so as to be reasonably comfort- able under reduced lunar gravity. The multi- purpose support trunnions not only provide a means of support aboard the Moonmobile, but they can serve as a point of attachment for "fly- ing belts." They can also be used to hoist this "detachable man-propelled cabin of a Moon- mobile" into the spaceship. There are advantages to integrating the hard- shell space suit into the configuration of a vehicle such as a Moonmobile. If the astronaut must move away from his supply vehicle, the umbili- cal can be disconnected. Then the suit's self- contained oxygen and power supply will permit it to operate independently until the oxygen is used. In exploration missions this is important. When each crewman is contained within his own suit. the failure of one will not affect the others, In this way space clothing will provide each astronaut a better chance for survival. Moonsuit Page Index - - - - - - - Boys Life Page Life Science Page Moonsuit Toys Page Moonsuit Misc - - - - - - - ...See more Moonsuit Sources!